Nice outfit Krystin! I really like the red purse. It seems to add just the right pop of color. Plus I'm becoming a big fan of hats! Great look! I can't believe this dress is Loft! Love it! Love the way you styled this dress! I just purchased it and have been struggling with how to wear it. Girl, this combo is AMAZING! I love this dress on you and I never would have thought to layer a denim shirt underneath but it's so perfect. Love the chambray under & the pop the purse brings to the look! So pretty!! I saw this dress at Loft and didn't look twice at it -- now I see it on you and how you've styled it and I HAVE to have it!! Love this!! I Iove the way you styled this dress and red bag works perfectly. Your style is SO on point I can't stand it! 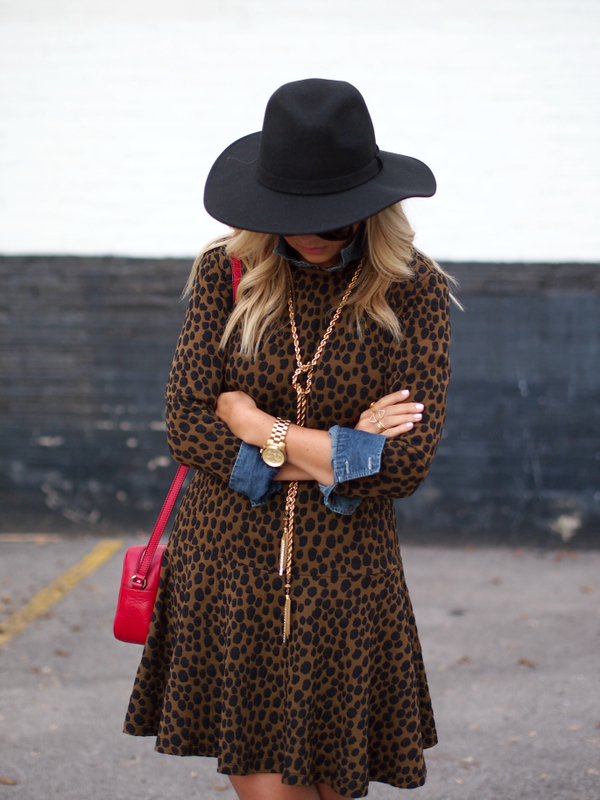 That shade of denim is the perfect complement to the leopard print! Love this look! It's a great way to layer for fall. Casual yet sophisticated.